According to the Flickr Interestingness measure of how popular a photo is, this was my most popular photo of 2012. Tomorrow, we will start to learn what 2013 may have in store. 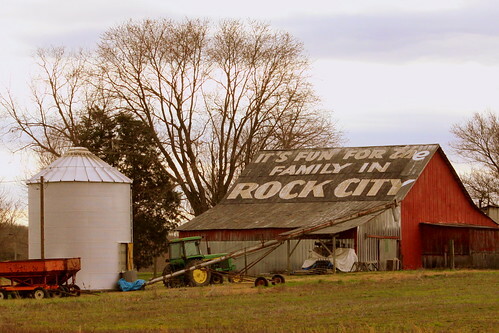 If you live in the not-so-deep south, if you were to think of an advertising barn, you'd think of the many "See Rock City" barns that used to be all over the countryside. This barn used to be one of those. At some point, however, the rival barn painting tourist trap from Lookout Mountian was permitted to repaint this barn with a "See Ruby Falls" message in their colors of red and turquoise. 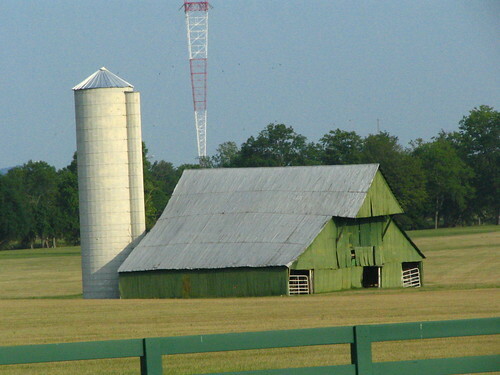 This barn is on U.S. Highway 41 right on your map where it says Noah, TN in Coffee County, just north of Manchester. With the construction of Interstate 24 about 40 years ago, this highway is less often used now. 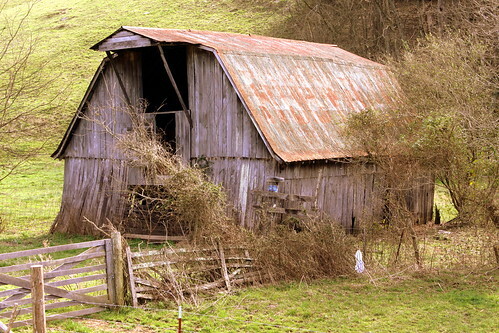 So this was probably painted before then, and would have been a rock city barn before that. Rock City Paint was some high quality mixture, and has been known to outlast many things. The ruby falls paint has chipped just enough that the Rock City white is beginning to show through. I now have a total of 77 different Rock City Barns I have photographed and uploaded to Flickr in my Rock City Barns set. People often ask me how I've found so many of them. I have drawn from many resources such as books and web sites and sometimes luck, but there's not really one "go to" place to find them all. Well, now on my website, I have tried to create a one stop source for the locations of all of the barns I've been to. On my Map of Rock City Barns page, I have plotted each barn on a Google Map. 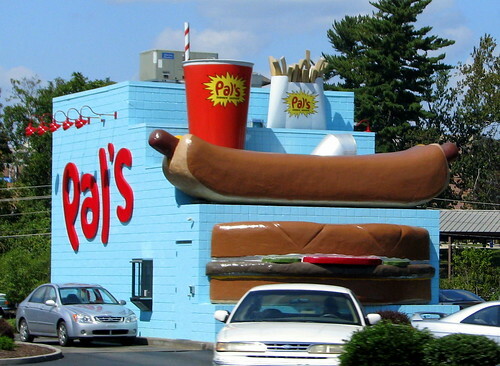 As discussed in the previous two posts, Pal's is a small but popular fast food chain found in and around far east Tennessee. If you've never seen one before, their standard design buildings are quite eye-catching with a giant hamburger, hot dog, fries and soda on the building. The chain started with humble beginnings with their first store remaining unchanged since 1956. It was with the opening of their second store on the north side of Kingsport (Lynn Garden area) when they started to have an attention-grabbing building four years after they opened. Here we have a Muffler Man, but instead of holding any car parts, the Big Pal's Man is holding a giant hamburger. As of 2012, he's been there for 50 years! 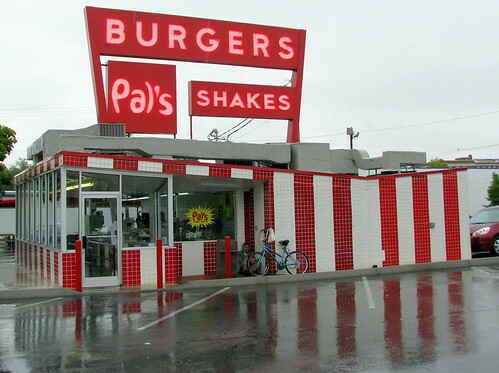 Pal's is a fast food chain in and around northeast, TN. They are best known for their large burger, hot dog, drink and fries on the building, which is seen on most of their locations and was in yesterday's post and can be seen here. This is located in the heart of Kingsport, just a couple of blocks from the central business district. 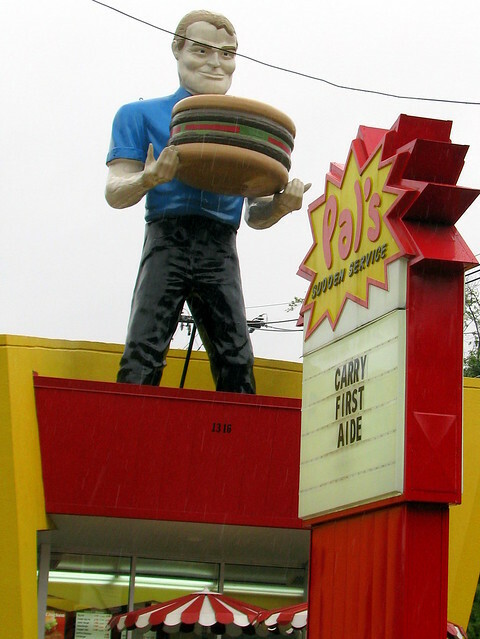 Pal's is a small chain of fast food restaurants in far East Tennessee. They are very popular with the locals and after having a chance to eat there a couple of times, I can see why. I really liked their burgers and their milkshakes are about the best I've had at any fast food place. (I tried the chili dog and thought it was ok, and I wasn't really impressed with the fries. Obviously, the first thing you notice s the building with the large "big pal" Burger coming out the front, with a giant hot dog, beverage cup and frenchie fries on top. All of their approx. 20 locations outside of the first two stores have this general design. I was also impressed by the sudden service, as the name implied. You drive up to a window on the right side and speak to a person (not a speaker) to order, then drive to the other side where it's already waiting for you. For someone like me who can't get In-n-Out Burger in this side of the country, this makes for a nice alternative. 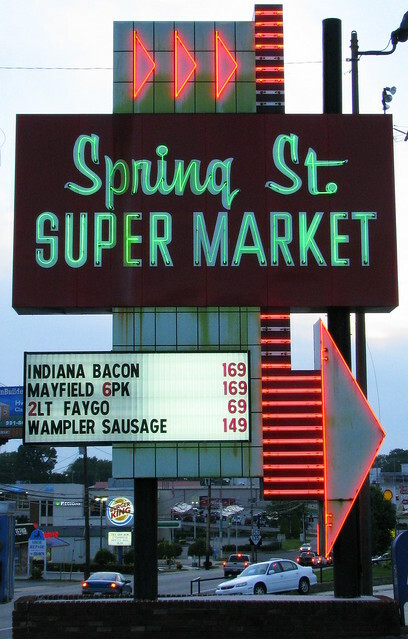 A neat neon sign on US70N in Cookeville, TN. The Reddish lights progress in order, starting at the top left, then the horizontal lines from the top to the bottom, and finally the big arrow at the bottom right. 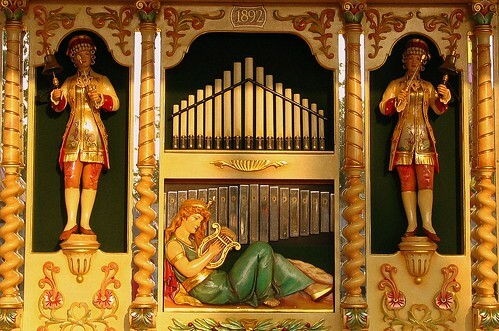 Maintained by Drew Expositions and appearing at the 2006 Williamson County Fair, this Antique Band Organ was built in 1892 in Germany by Ruth Organs. Early in the 20th century, it was converted to play automatically by the Wurlitzer company. In addition to the organ, it plays chimes, bells, bass and snare drums, wood block, triangle, cymbal, timpani and crash cymbal. 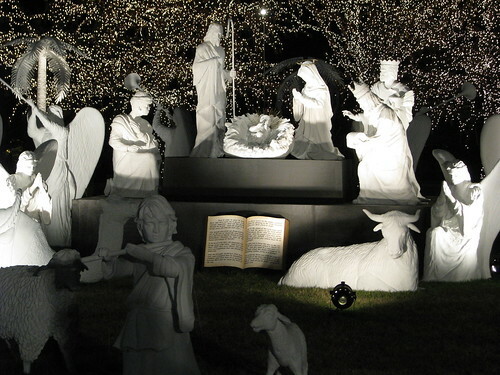 Christmas-time has brought a new tradition to those who travel down Franklin Road (U.S. 31) in Brentwood, TN (which is a suburb of Nashville). As a traveler, the stream of fancy businesses turns into newer mansions, and then appearing is a wide-open space that looks like it has been preserved in time. 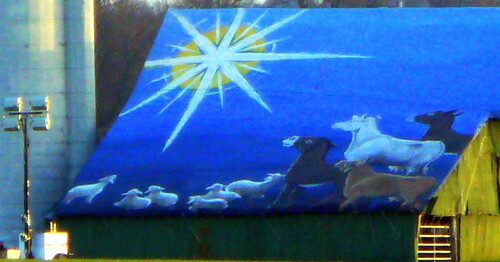 From behind a small hill and a green fence until 2010 used to emerge an old barn with a mural of the star of Bethlehem giving light to several barnyard animals. In 2011, a storm toppled the old barn, but for 2012 a new pavilion has been built at the same spot to continue to display the mural for at least another year. Often I have written on this blog about barns with advertisements painted on the them. This one is different. Nothing is being advertised, but instead, the season is celebrated. 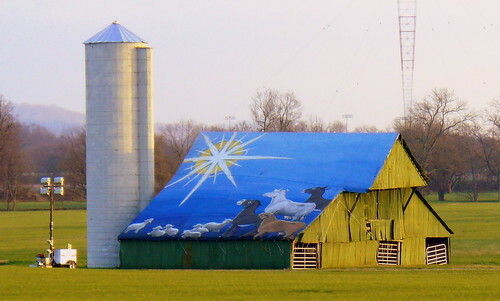 The barn isn't painted, but instead, a 400-pound mural is carefully unwrapped and placed on this barn every December. After Christmas has passed, The mural is carefully taken down and put into storage not to be seen for another 11 months. The 48' x 38' over-sized Christmas card was first seen in 1996. Turner Jr. commissioned local art-teacher Chris Tibbot to paint the mural. However, the art is not going to last forever. The painting is fragile since it is exposed to the elements. in years past, they had decided that they couldn't put it up anymore. So far, though, they think it can make it one more winter. This might be the last year it is shown or maybe next year, they'll bring it out for the last time again. The barn was a concern even before the 2011 storm knocked it over. 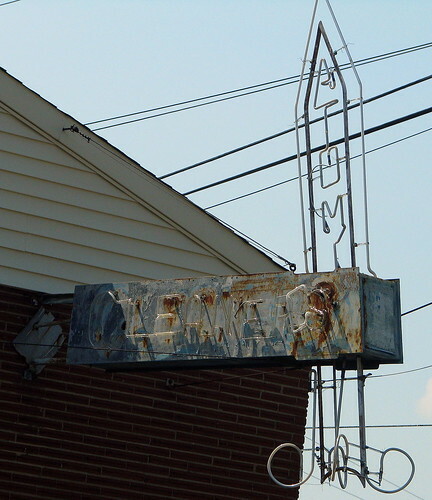 It was built in the 1940's, but over the years, it had slowly deteriorated to the point where now it wasn't used for anything other than the yearly display. A fierce storm even came through in 2010 that uprooted some of the nearby trees, but the barn held on. Other things of note from the barn. On the left is a portable light which will illuminate the barn some nights during the season. The animals in the painting are sheep and donkeys and one white Charolais cow, which used to be bred on this farm and were known as "Cal's cows." The large radio tower which is about a mile away is the signal tower for WSM 650 AM, the legendary station which has been the "home of the Grand Old Opry." At the time of the tower's construction in the 1930's it was called the tallest radio tower in the world. Providing a great view of the public square, the Observation deck has a couple of wreaths added for Christmas. 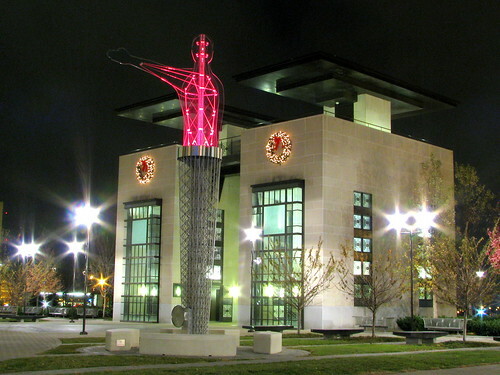 Also, in front is one of the two new "Citizen" sculptures added to the square in 2010. The illuminated glass portion slowly changes colors, and I waited for it to turn red to fit the Christmas theme. 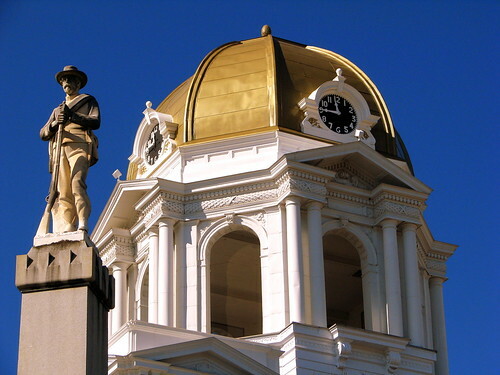 In Greeneville, TN, the town where Johnson called home most of his life, a replica of the birthplace was built in 1999. It's located next to his early home, a statue of him, and the visitor center which has encased his tailor shop. This building represents an important part of President Johnsons's story and speaks of a man who began his life in humble conditions but later became the seventeenth president. 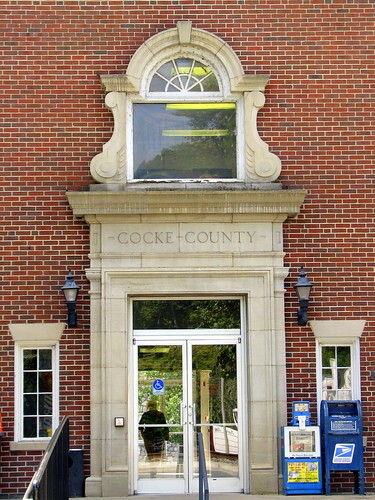 The Cocke County Courthouse was built in 1930-31 after the previous one in Newport burned down. The three story Classical Revival brick building features heavy stone quoins at each corner. Projecting end pavilions flank the center, which features five tall arched courtroom windows on the 2nd story. 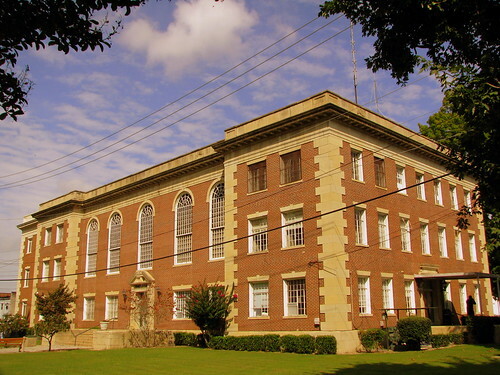 In 1974, this courthouse was the home to a prominent snake-handling trial. 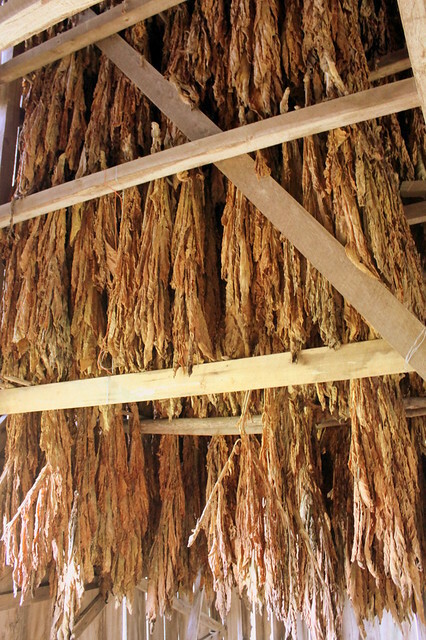 Over the years, there have been many trials here for moonshining, pot growing and cockfighting. Hopefully not for the above reasons, the courthouse is on the National Register of Historic Places. 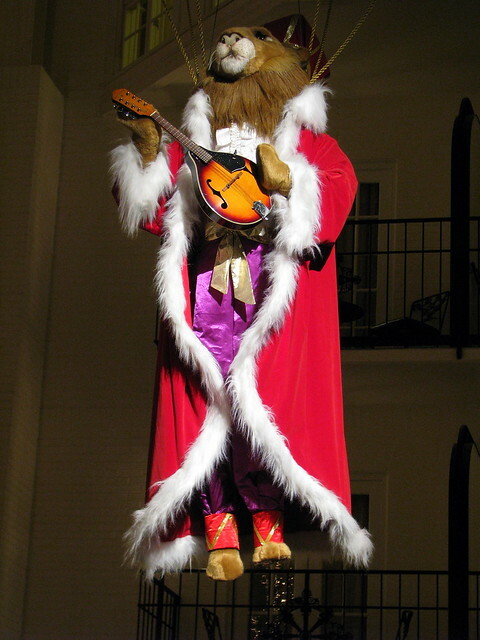 Nothing says "Christmas" like a mandolin-playing robed lion suspended from the ceiling from a parachute in Opryland Hotel's Conservatory Gardens. To round out the band, there was a cello playing giraffe, a panda bear on Saxophone and a non-illuminated zebra (so I couldn't tell what he was playing). 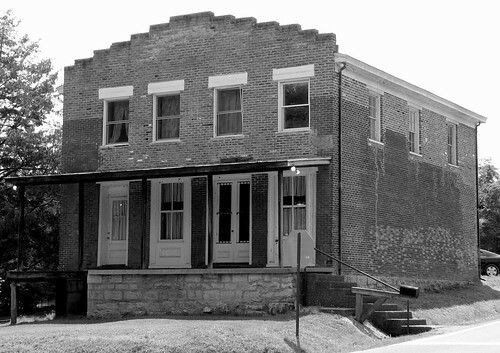 built in 1859, this became the main building in the historic Tennessee town of Port Royal, In addition to being the Masonic lodge, this was a general store, Doctor's office and Post office. 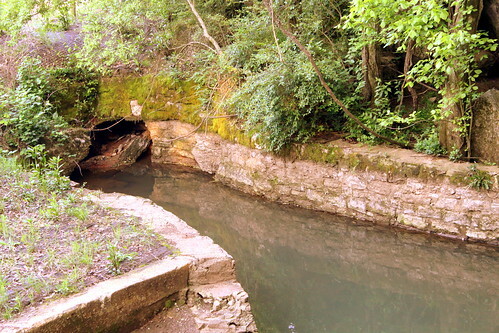 Today, what's left of Port Royal has been designated a state historic area, under the oversight of the Tennessee State Parks. This building today is the park's headquarters. 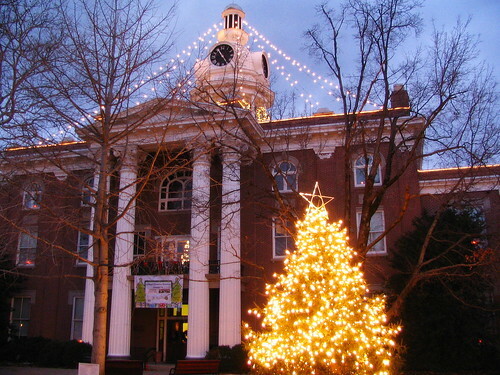 In the early 19th Century, the town of Murfreesboro was established not far from the town spring. Time passes, and the city expands; eventually the spring is forgotten as several new developments encroach on the area. Starting in 2002, with the building of the Discovery Center nearby, the city and local parks department brought the spring back to its former glory and developed the Murfree Spring Wetlands. 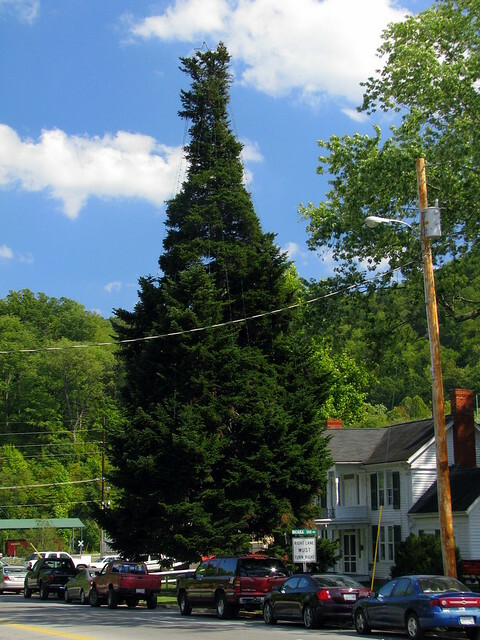 This is the way the tree looked in 2008, but it's pretty much the same every year. If you look closely, you can see Santa on the balcony. It was a gloomy fall day when I drove past the 125 year old Insane Asylum, but in a way I suppose that's appropriate. Of course, these days they're not called insane asylums anymore. One can only hope that an upgrade in the name also leads to an upgrade in patient care as mental health hospitals do tend to be poorly funded. 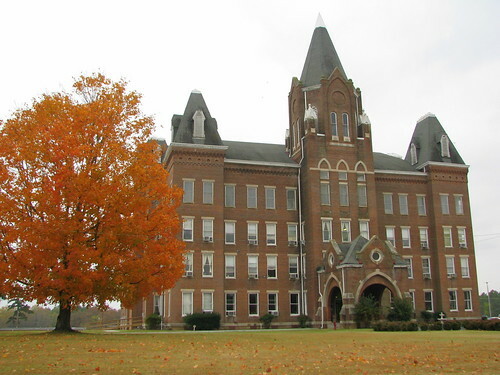 The Institute is in West Tennessee in the town of Bolivar. I didn't realize it at the time, but I probably shouldn't have been driving around here at the time. (Guards probably don't like that.) Shown here is the original building which today is the Administration building. It had wings on either side which were condemned and removed in 1980. Today, the building just off US64 is on the National Register of Historic Places as part of the Western State Hospital Historic District. If you do a google search of this place, you'll likely find a bunch of ghost stories or other such hauntings, but it's no Waverly Hills Sanatorium. As the area began to develop, citizens began to realize that they needed a place to invest their money. 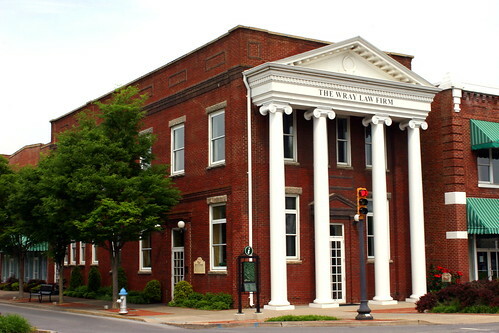 As a result, the Bank of Kingsport was built in 1912. This financial institution was the first bank in the model city. It holds another place in Kingsport history because the bank was declared insolvent" during the Great Depression in 1929. 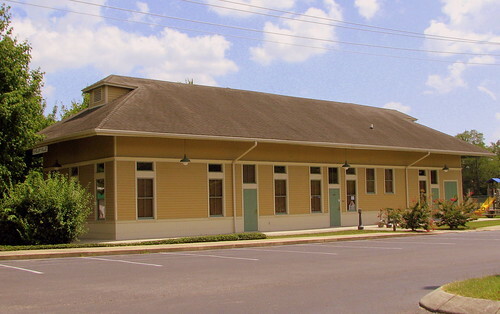 The building was renovated in the late 1980's. 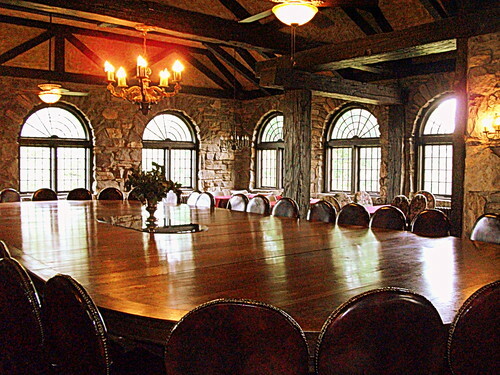 Milky Way Farms and it's Tudor Style mansion is home to what is believed to be the largest dining table in Tennessee. The farm and mansion was the home of Frank Mars, the creator of the Milky Way candy bar. If you were ever to be served a meal at this home a few miles north of Pulaski, you would find it can seat up to 40. Photo courtesy of my mom, who took the tour. Her big question for the cleaning staff was how they keep the center of the table dust free. They have a duster with a really long handle. You might notice the 3 wooden slats on the right are a slightly different color. Almost 20 years ago, a tornado came through this area and ripped that portion of the barn off. The wood was replaced, and then repainted. This is one of over 75 different Rock City Barns I have photographed and uploaded to Flickr in my Rock City Barns set. People often ask me how I've found so many of them. I have drawn from many resources such as books and web sites and sometimes luck, but there's not really one "go to" place to find them all. Well, now on my website, I have tried to create a one stop source for the locations of all of the barns I've been to. On my Map of Rock City Barns page, I have plotted each barn on a Google Map. Mount Olivet Cemetery Chapel, 1101 Lebanon Pike, Southeast Nashville. Built in phases between the 1870s and 1940s, this Gothic Revival-style building was likely designed by Nashville architect Hugh Cathcart Thompson, best known as designer of the Ryman Auditorium. It served as the chapel and offices for the historic Mount Olivet Cemetery until it was replaced with a new facility in 1996. The brick building features a cathedral ceiling with original woodwork in the octagonal vestry, two bell towers, a built-in vault and pointed arched windows. 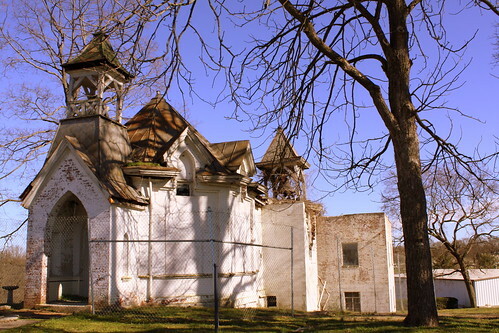 The Tennessee Preservation Trust placed this building on its endangered properties list in 2005, the same year the entire 206-acre cemetery with its 192,000 burials was listed in the National Register of Historic Places. 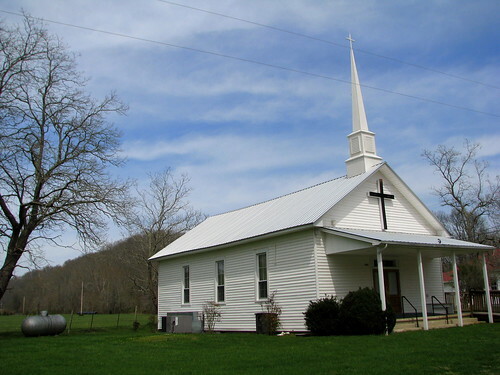 The historic chapel and office is currently vacant and deteriorated. For local photographers, these lists make up things you might want to go see before they are gone forever. 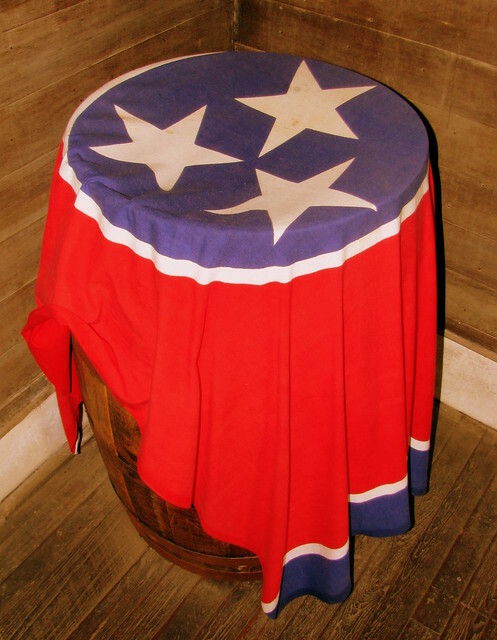 located inside the original Jack Daniels office during part of the Distillery tour, we see a Tennessee flag draped over a whiskey barrel. 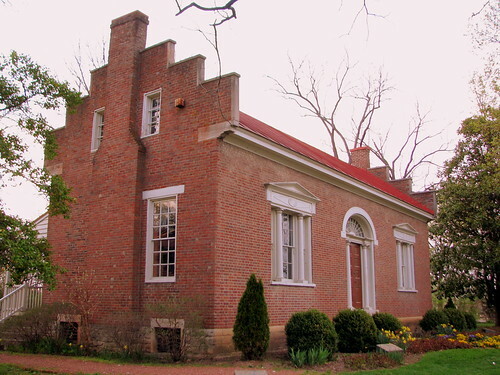 The Carter House is a historic house along Columbia Avenue (US31) in Franklin, Tennessee. In that house, the Carter family along with neighbors and servants hid in the basement waiting for the second Battle of Franklin to end. 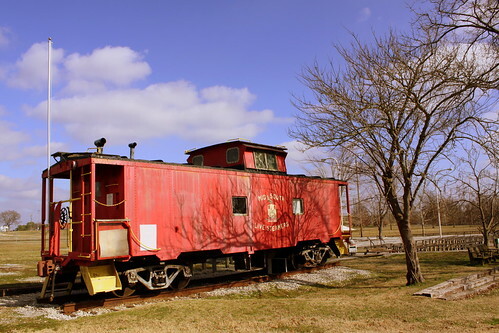 It is a Tennessee state historic site, and it is a contributing property and centerpiece of the Franklin Battlefield, a U.S. National Historic Landmark historic district. Fountain Branch Carter completed construction of the house in 1830. 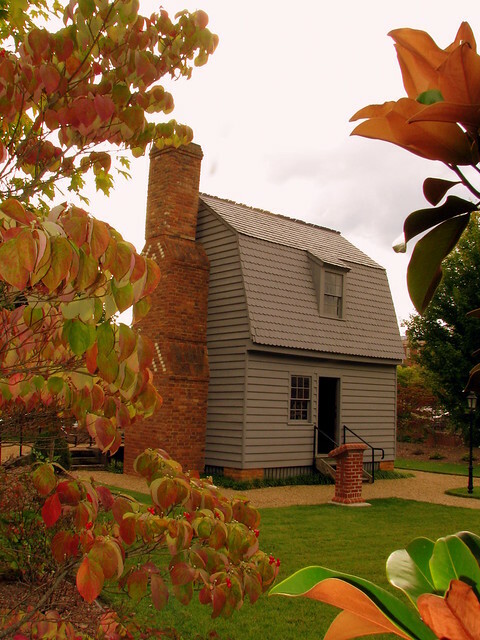 The federal style brick farm house was accompanied by several other outbuildings such as the farm office, smokehouse, and kitchen. The house and the other three buildings are still intact and illustrate the horror of the Civil War battle with over a thousand bullet holes still visible, making it perhaps the most fired upon building during the war. 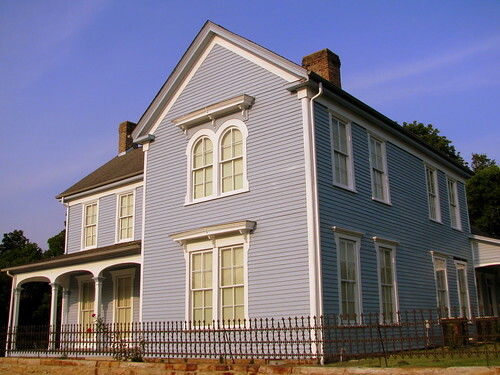 The Carter House played a very important role in the Second Battle of Franklin. Prior to the fight, the house was used as Federal headquarters. After the battle it was used as field hospital aiding both Federal and Confederate wounded. The middle son of Fountain Branch Carter, Tod Carter, was mortally wounded in the battle. He was still alive the morning after the battle when he was found and brought to the house. There he lived for several more hours, surrounded by his distraught family. Tod Carter died of his wounds December 2, 1864, and was buried that day in Rest Haven Cemetery just north of town. He came home for the first time in over three years when he fought at the Battle of Franklin in the 20th Tennessee Infantry. The room where Tod Carter died is one of the features of the guided tour of the home today. Tours of the Carter House and grounds are available daily and include a video about the Battle of Franklin as well as a museum with artifacts relating to the site. The State of Tennessee owns the house, and the site is administered in partnership with the Tennessee Historical Commission by the Battle of Franklin Trust. This bridge was built in 1920 and reused piers from an earlier bridge. The bridge was built by Cincinnati Southern Railway, which was owned by the city of Cincinnati. I believe the city still owns this bridge, and over they years they have leased its use to Southern and today Norfolk Southern. The main span is a lift bridge, and has been that way since 1920, but was a swing bridge in a previous time. 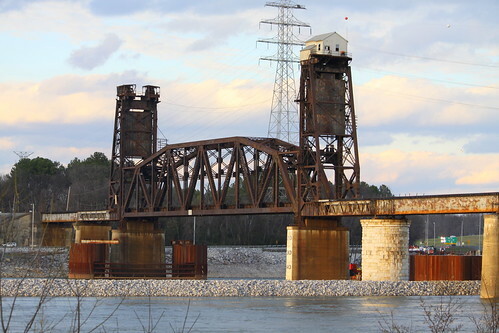 The bridge is barely downstream from Chickamauga Dam, and while it still can lift, it doesn't happen too often anymore. It is possible to see the bridge from either side of the Tennessee River. On the north side, you can see it while driving along TVA Access Road, although there's nowhere to park. On the south side, there is parking for the end of the Tennessee Riverwalk behind the Chattanooga State Community College. This is stop #24 on the TNTrailsandByways.com "Old TN Trail"
Unfortunately, it is gone now, but this rusty neon sign used to be in Goodlettsville on highway U.S. 41/31W.